Most of us are blogging, right? Whether for business or pleasure blogging requires a lot of work. In order for a business blog, or any blog, to be successful, it has to be managed like an important project. Everything from creating content to image research to promoting your blog takes skill and time. Running a business blog is a team effort. 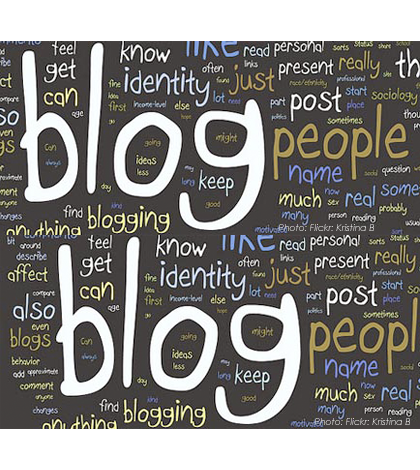 Blogging is a great way to position your business as the experts in your field and gain exposure. Before you begin it’s important to have a plan in place with goals and objectives so you have a sense of direction. Aside from that, you also need the passion and the people to manage and create content that matters. Here are business blogging tips to help marketers better manage the blogging process backed by some experts from our community. Consistency is important when establishing a blog for both your business and your readers. It will help you stay on schedule and let you know when content needs to be produced. Stay on Topic. Part of being consistent includes staying on topic. Make sure you focus on topics that fit your product niche and appeal to your audience. Use Your Brand Voice. Sometimes we aren’t the only authors for our blog. Whether you decide to hire an agency, invite a guest blogger or have everything done in-house be sure everyone understands how to write using your brand’s voice. Creating blogging guidelines is a must for ensuring consistency on your blog. It’s best to be as specific as possible when creating guidelines providing examples of tone, proper use of headings, grammar and even use of images. Managing the look and feel of a business blog is just as important as managing the textual content. Choosing the wrong images can throw your blog’s look and feel way off. Creating a style guide offers a solution. Having guidelines in place provide all authors the tools to successfully create content without being intimidated. Take our guest blogging guidelines for example. Implementing an editorial calendar is crucial to managing your business blog. It will ensure content is being created and published on schedule. It all goes back to the first tip of being consistent. Having an editorial calendar keeps you ahead of your own game. It will help with managing and assigning content to specific authors as well as showing you a bigger picture of the week or month ahead. This is one of the most important tools to keep up to date in my opinion as it lays out what has been published, what is pending. In addition, it gives you an idea of the types of content that is going out (i.e. white papers, text blogs, video, interview.) That way you can plan to include more variety in your posts. Building a great business blog means that you provide quality and value – consistently! Your audience will appreciate an educational tutorial or resourceful white paper that helps streamline their day. Think of the many ways you can add value on your business blog without focusing too much on your product or service. Sure, mention how you can help them out or how your product can save them time, but think big picture. When you help someone out, they will come back, possibly share your stuff on social media and maybe, just maybe become a client! Imagery is so important when blogging. In essence you want to create a story and paint a picture in the minds of your readers. With so much content available online people will naturally gravitate to blogs that are visually appealing. In addition, your copy should be just as good, especially your headline since determine whether or not your post will be read. You shouldn’t feel like you’re shooting in the dark when it comes to blogging. Use Google Analytics to find out who’s visiting your blog, how they are finding you, how long they’re staying on your page and which topics are most popular. Knowing this information gives you a better idea of where you should be spending most of your time. Plan your editorial calendar around your findings. You can also discover which social media sites are working best for promotion, where people are dropping off and even how long they’re staying on your site. Make sure you properly install analytics and use tracking codes when sharing your blog posts. You might have heard us say, “we grow brands with fans!” It’s what we do, and for good reason. Without your fans, your blog would be a ghost town. When you love your fans they will show their appreciation by sharing your content, signing up for your newsletter, becoming loyal customers, or even sending potential clients your way. You can show you love your fans in a number of ways, one of the easiest ways is to feature them on your blog. Employees. Your staff is with you day in and day out. They help keep your business running like a well-oiled machine. Surprise your people by featuring them in a fun way. This is great because it let’s your employees know how much you appreciate them while humanizing your brand to the outside world. Customers. Your customers are some of your biggest fans. After all, they buy your products and use your services. Ask them to send in photos interacting with your brand to be entered in a contest or to receive a fun promotion. Or better yet, feature customer stories. Take your those testimonials and bring them to life with video and photos. If possible, share your personal experience with a loyal customer. Experts. Some of your fans are experts in their own right. Highlight what they do in the form of an interview or guest blog. Be sure it directly relates to your blog topics. When sharing their feature on social media mention them when you can. Sharing is caring! Not only should you share your own stuff, but share valuable stuff from people you follow. Your audience will thank you for being a resource and connecting them to other good reads. Besides, it creates a good mix for when you share your own content. Social Media. Utilize all your social media accounts to share your content. Going back to tracking, be sure you include a unique tracking code for each channel. Newsletter. Setup a newsletter so you can deliver content directly to your fans. I recently heard that your email list is your lifeline. It’s important to have those direct contacts. What other business blogging tips can you add to this list? Let us know in the comments below.